Spectators shelter under an umbrella during a break for rain at Headingley yesterday (Picture: Simon Cooper/PA Wire). CLASSIC first day Headingley. As ‘Yorkshire’ as a pint of Tetley’s and fish and chips at Scarborough. Amid the obsession for change these days – not just in cricket, but life – some things can always be counted upon. Like death, taxes and batsmen perishing when invited to open under overcast Leeds skies. In keeping with local tradition, thankfully for England’s sake, there were also requisite rewards for application and pugnacity with bat in hand. Step forward Jonny Bairstow and Alex Hales. It ultimately proved a quintessential day for the hardy Test traditionalists, bedecked in cagoules at a parky Leeds, with the pre-match belief that it was a ‘bowling morning’ ringing true in broody conditions. Although in its own way, the swift counter-punch led by one of the White Rose’s own in Bairstow and Nottinghamshire’s Hales also showcased aspects of the new alongside the old, both vital if Test cricket is to survive and prosper. By the end, another inevitable tradition in these parts came to pass as the first Test of the English summer was curtailed by rain at tea-time in front of a modest 9,436 crowd. More brollies were in evidence than beersnakes on the Western Terrace, although there was entertainment prior to that for the discerning Yorkshire eye. It was headlined by Bairstow, who typically led the charge with England teetering at 83-5 with his county colleague Joe Root suffering the ignominy of leaving the fray for a duck earlier at his home ground. We will gloss over that. As for Hales, the Notts batsman showed that his reputation as a dasher may not necessarily be quite the full story after digging in and showing circumspection, which not too many believed he possessed in his armoury. 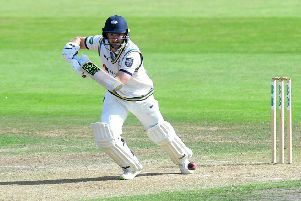 Sugar rushes of activity for the modernists arrived sporadically, Hales striking 10 runs off three balls after a quiet first hour, while Bairstow and debutant James Vince plundered two boundaries in three deliveries in mini-flurries. Another debutant in Dasun Shanaka grabbed 3-1 in a 10-minute spell before lunch as England lurched from 49-0 to 51-3. Test cricket boring? The view of Alistair Cook – who exited for 16 as he seeks to become the youngest player to reach the magic milestone of 10,000 Test runs – that he would have also bowled given the chance was further reinforced not long after lunch. Half of England’s side were back in the sheds with the score at 83, with the outgoing Ben Stokes – with memories of that over at Eden Gardens still fresh in the minds of many – having another non-vintage moment. The late, great Brian Close once spoke about 5,000 partisan captains giving you ‘advice’ when you walk out at Headingley. Those days may be gone, although the message that Stokes will have received after injudiciously holing out to mid-on for 12 would not have been polite from the more seasoned White Rose wags. Thankfully, messrs Bairstow and Hales applied the balm.